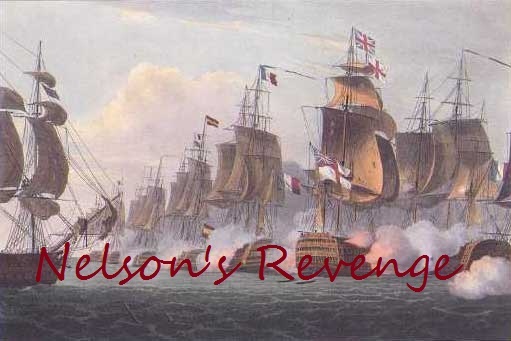 Nelson's Revenge: For the FUN of it!!!! Today we had the 2012 FUN tournament in our clubhouse and it was indeed fun. After six years of absence to the tournament scene in general and Warhammer in particular it went all surprisingly well. I had only one battle under my belt before and that was 2 weeks ago, overall my Deamons performed well despite a lack in mobility. Initiative 1 may seem far to little but their high strenght and toughness well makes up for this. My first battle was against Tom Degendt who fielded a mix of Nurgle warriors with 2 handweapons and Khorne spawns, all infantery and loads of attacks. Needless to say I got butchered and in the end only my greater deamon remained. The runner up was Sven with a Nightgoblin army, a HUGE Nightgoblin army. We had only 2 turns each due to a lot of looking stuff up in the rulebook but it was great nonetheless and I even managed to score a draw. Last battle was against a guestplayer called Wim who showed up with an Araby army. At first I was a bit afraid, he had a sodding elephant in his gang, the poor animal got pounded by my Great Unclean One for all it's troubles and in the end only his unit of Magic Carpet Riders remained, solid victory against a fun player. So I didn't finish last nor first and the trophy for best painted army went deservingly to Sven and his Nightgobbos so I came home emptyhanded but very happy. I certainly need to make my existing units a lot bigger, from 20 to 30 Plaguebearers and 15 to 20 Furies. Said Furies performed well today but they need a second unit of them. Swarm of the match however were my Nurglings: they took cavalry charges, pissed off elephants, shrugged most of the bow and warmachine volleys and dished out a bloody lot of hurt despite being only pint-sized. I simply love them and I want more of these little bastards in my army. For now however I'll leave my Deamons alone and give them some desrved rest, Albion will get all my attention for the time being and as soon as I got a 1000 points ready of them I'll be happy to field them against Tomsche's Cathay army. I couldn't believe there was something smaller and more pesky and stinky in the whole tournament than my Goblins but yes...the Nurglings were all of that!